Kinetic watches don't need batteries - they get wound by the movement of the arm that wears the watch. 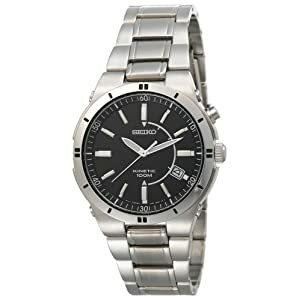 This watch has a stainless steel band, case and bezel that are silver toned. The black dial and luminous hour markers and hands look very cool. One thing that is different about this watch is the date is in the 4 position, instead of the typical 3 position. The back is also clear, so you can take the watch off and look at the inner workings for some cheap entertainment. Water resistant to 100 meters (330 feet), so it's safe to throw the wearer into the pool.